Sail away with the Eurodam. Exclusive cruise deals only available on Dreamlines.com. Step back in time onboard the Eurodam. Launched in 2008, this mid-size ship is a testament to classic ocean lining. With its Dutch design and collection of Rembrandt artwork, the ship pays homage to the company’s origins in Holland. Understated and elegant, the ship provides the perfect balance of old-world charm with modern amenities. The Eurodam features a high number of Ocean View staterooms, an expanded spa facility, and more entertainment options than ever before. Despite its high passenger capacity, cruising onboard the Eurodam doesn’t feel crowded. Nine different onboard restaurants spread out the mealtime crowds. Private poolside cabanas allow guests to enjoy a higher degree of privacy at one of the ship’s most popular areas. 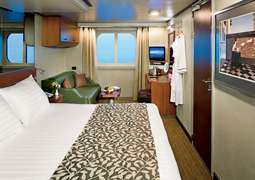 And spacious staterooms give passengers plenty of room to relax and unwind. Eurodam was the first Signature-class ship of the Holland America Line. What truly sets this class of ship apart is its high level of service. Service staff are friendly and attentive, making it their number-one priority to provide every passenger with a comfortable, pleasant cruise experience. Staterooms on the MS Eurodam are elegant and traditional, providing just enough amenities to ensure a comfortable journey without being overly complicated. 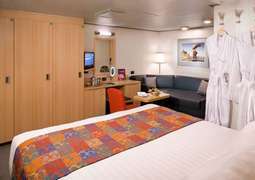 Nearly 70% of the ship’s 1,052 staterooms have a private balcony, and with an average size of 175 square feet for interior staterooms, they are particularly spacious compared to other cruise lines. Three classes of suites provide larger staterooms, more amenities, and access to the exclusive Neptune Lounge, and an additional category of spa cabins provides healthy dining options, luxurious bath amenities, and close proximity to the spa facilities. Dining is one of the highlights of the MS Eurodam. With six included dining options and four for-fee restaurants, even the most picky passengers will find something to satisfy them. Start the day off with a leisurely full breakfast in the Rembrandt Dining Room, where you’ll find everything from fluffy pancakes and hearty scrambles to light choices such as cereal, yogurt and fresh fruit. Grab a quick bite at the Dive-In Grill or New York Pizza place for lunch, then enjoy a luxurious dinner at the Pinnacle Grill, where you’ll find gourmet steaks and local seafood. Additionally, Holland America cruises keep the tradition of afternoon tea alive, perfect for an afternoon pick-me-up or an excuse to savor a sweet treat. Dining on the MS Eurodam is particularly accommodating of different dietary requirements, with a variety of vegetarian, vegan and gluten-free options at most restaurants. Primarily focused on an audience of mature adults, the entertainment on the MS Eurodam revolves around classical music and retro entertainment. The most popular show is Billboard Onboard, where dueling pianos play chart-topping hits from different eras. Audience members are encouraged to sing along and request their favorite songs. A close second is the B.B. King Blues Club, a live music venue playing the best in Motown, funk and soul that turns into a dance club late at night. The Lincoln Center Stage provides a more formal, concert-hall vibe. Here, classical music concerts and live chamber music performances take place throughout the evening. No cruise ship is complete without a swimming pool, and the MS Eurodam has two: the Lido pool, with its retractable roof and rentable cabanas, and the Sea View pool, an adults-only oasis perfect for laying in the sun and watching the waves go by. Passengers onboard the MS Eurodam can expect a casual dress code during the day with a slightly more formal standard at night. Shorts and jeans are common during the daytime, with most passengers wearing long pants and button shirts or skirts and blouses in the evening. Longer cruises will typically have two or more Gala Nights, where there is no upper limit to how formal you can dress. Some passengers go all-out with fine tuxedos and ballroom gowns, while others keep it more traditional with suits, sports jackets and cocktail dresses. Holland America Line’s first Signature-class luxury cruise vessel, the Eurodam debuted in 2008 with its 10-day maiden voyage from Copenhagen. She is the largest Holland America Signature-class ship and stands for classic cruise experience with superb dining options and excellent service. Eurodam contains 12 elegant decks and features high attention to architecture, design, enrichment and entertainment. When cruising on this grand cruise liner, recent cruises were pleased with the crew of almost 1,000 people that were taking good care of all the guests’ needs. Eurodam departs from Fort Lauderdale port for cruises in the western and eastern Caribbean. 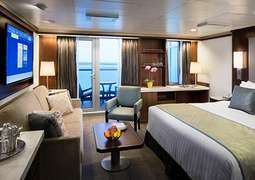 Much of the ships’ décor is a nod to the Holland America Line’s heritage and the traditions of cruising from years gone by. 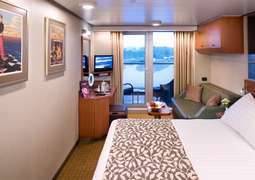 On a cruise aboard Eurodam you will be able to enjoy your privacy and the feeling of spaciousness. Speaking of the dining onboard Eurodam, they are top-notch and surely one of the highlights of every cruise with Holland America Line. Ship’s five dining rooms serve flavourful food from around the world, in eateries like the Pinnacle Grill, Tamarind and African-themed Explorer’s Bar. For a quieter night, step outside onto the deck for a romantic drink under the stars, and watch the waves go by. The private and intimate cabana zones, located around and above the major swimming pool remind more of a sleek South Beach resort than a cruise ship. If you are interested in classic sailing experience, unusual itineraries and excellent service, Eurodam is an ideal choice for you! If you just simply require more information about cruise deals with Eurodam then simply give us a call 1-888-403-1425!